The Mayan Long Count Calendar came to an end on December 21, 2012 the bakun date of 13.0.0.0.0. The world of course did not come to an end. More precisely the day was the end of the Mayan Great Cycle. The Great Cycle is made of 13 bakuns of 144,000 days or a total of 1,872,000 days. The current Great Cycle we are in will end May 3, 7138. The Mayan Long Count calendar is based on cycles of days. These cycles are for the most part based on multiples of twenty. Uinal 20 x kin = 20 days. Tun 18 x uinal = 360 days = 0.99 years. Katun 20 x tun = 7,200 days = 19.71 years. Bakun 20 x katun = 144,000 days = 394.25 years. Pictun 20 x bakun = 2,880,000 days = 7,885 years. Great Cycle 13 x bakun = 1,872,000 days = 5,125.26 years. Version 3.2 is a minor change to the program. A new feature is the ability to copy all values to a clipboard to paste into any program. This update should replace all previous versions of the program. Years from 99,000 B.C. to 99,999 A.D.
Elapsed days - Great Cycle. Remaining days - Great Cycle. 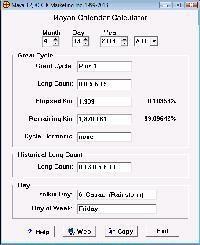 The Free Mayan Long Count Calculator will run on any 32 bit Windows platform. This includes Windows 98, Windows NT, Windows XP, Vista, Windows 7 and Windows 10. Version 3.2 is a minor rewrite of the program. It should replace all previous versions of the program. Web Page & Graphics - Copyright © 2018, C K Marketing Inc. - All Rights Reserved.